The pool is open yearly between Memorial day and Labor day. 2pm to 4pm Sundays only. The following rules and regulations have been established for the benefit of all residents and their guests to ensure their safety while using the pools and facilities. Anyone in violation of these rules may be asked to leave the pool area. Continued violation of these rules is cause for suspension of pool privileges. 1. 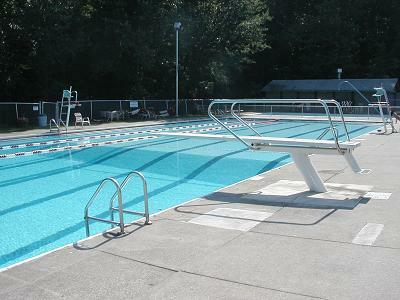 The pool will be open daily from 12:00 p.m. to 8:00 p.m., weather permitting. If hours arechanged, they will be posted at the swimming pool and recorded on the answering machine. 2. Our residents and their properly identified guests can use the pool. Residents are defined as year-round occupants of properties in Ledgewood and their legal dependents. Visiting friends, people spending the summer, relatives (including children of residents who no longer are dependents or grandchildren), former Ledgewood residents, etc. do NOT meet the definition of resident/dependent. 3. There are no physical pool passes. We have a new identification system. In order to be added to the system, residents will need to show proof of residency. Proof of residency must include your name and address on it. Examples of acceptable proof of residency: driver’s license, water bill, electric bill, report card, doctor’s bill. Your information will be added to the system and your picture will be taken. Children under 5 will not have their picture taken. 4. Guest passes will remain at the pool and be maintained by the pool staff. Each household will receive thirty (30) free guest passes. Residents can purchase additional pool passes in groups of 10 for $20.00 after the 30 free passes are used. Residents must be present to sign in their guests. 5. No person may use the pool unless a lifeguard is present and on duty in the pool area. 6. All residents and guests must check-in with the lifeguard at the front desk. 7. Children under 12 must be accompanied at all times by a resident adult at least 18 years of age. • 3rd: Individual will be sent home and will not be allowed to return until a meeting is held with pool manager, pool trustee and a parent or guardian if the individual is a minor. 9. Offensive language will NOT be tolerated. Any use of profanity, vulgar, or offensive language witnessed by a lifeguard or reported to a lifeguard by an adult, will result in immediate removal from the pool for the rest of the day and possible review by the manager or trustees. Verbal or physical abuse of a lifeguard or reckless endangerment of other swimmers will result in immediate removal from the pool. Lifeguards have been directed by the trustees to request assistance from the Strongsville Police when any situation might compromise the safety of the lifeguard staff, residents, and/or swimmers. 10. All swimmers (except adults) are required to take a rest break each hour while at the pool. This means anyone under the age of 16 must completely exit the pools. Breaks are scheduled the last 10 minutes of every hour. There is a 15 minute rest break the last hour at the end of the day. 11. Alcoholic beverages are NOT permitted in the pool or deck area. Smoking is NOT permitted with in the clubhouse, deck, or pool area. A designated smoking area is available outside thebuilding. .
12. Glass containers or bottles are NOT permitted in the pool area at ANY time. Paper and cans should be thrown in the trash containers provided in the deck area. Please pick up your own litter when you are leaving. 13. Chewing gum is NOT permitted in the pool area. 14. Proper swimsuits are required at all times in the pool. Clothing that could contribute to entrapment and inhibit life-saving measure, loose fitting clothing, heavy garments, and jean shorts are prohibited. 15. Deck chairs and lounges are intended for adults, unless the pool is not crowded. 16. Rubber Ducky Day is on Sundays from 2:00p.m--4:00p.m. Rafts, floats, or similar floatation devices are permitted in the main pool only during this time. Noodles are allowed at any time. 17. Children who are not toilet trained must wear a swim diaper in our pools. Our lifeguards are trained to respond to a bacterial release in our pools. Should there be an accidental bacterial release, the lifeguards will evaluate the situation and respond. The pool may be closed for a period of time while additional chlorine is added to the water. If additional steps are necessary, lifeguards will make the decision with the manager and trustees, following all required health standards to protect the safety and health of our residents. 18. Only Coast Guard Approved life jackets will be allowed to be used in our pools. 19. Non-swimmers are NOT permitted in the deep end of the main pool. Non-swimmers are identified as any patron that needs the assistance of water wings, life jackets, noodles, or any other floatation device to stay afloat. 20. An adult needs to accompany any child that needs the assistance of a floatation device in our pools at all times. 21. Children using the baby pool must be accompanied by an adult at all times. There is no lifeguard on duty for the baby pool. Adults are responsible for the safety of their children while using this pool. • In order to use the diving board, patrons must be able to swim one (1) width of the main pool without stopping. • Only one (1) person is allowed on the board at a time. • Only one (1) bounce is permitted. • Forward dives/flips only. Back dives and flips are not permitted. • The deep end is reserved for diving board use only. No swimming in deep end, unless going off the diving board. 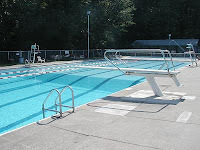 • Persons using the diving board, must jump/dive straight off the board. Jumping to the side is not permitted. • Flotation devices are prohibited when using the diving board. These include: life jackets, water wings, water rings, noodles, etc. 23. The East shallow end is reserved for adult swim only from 12:00p.m.-1:00 p.m. and from 5:00 p.m. - 8:00 p.m. Children are NOT permitted in this end during these times. 24. Continuous lap swimming is permitted in the two lap lanes. Please be courteous and be prepared to share your lane with other swimmers. Sitting, hanging on the lane lines, and diving into the lanes is NOT permitted. 25. Kickboards are available at the front desk. Kickboards must be used in the lap lanes only and should be returned to the front desk when finished. 26. Portable radios are permitted in the pool area, but must be set on a low to moderate volume level. If the volume is determined to be disrupting to the lifeguards or other residents, you may be asked to turn it off. 27. If an accident occurs at the pool, our insurance carrier requires an accident/incident report be completed. 28. No pets allowed at the Pool or Clubhouse area unless it is a service animal. 29. The lifeguards have the discretion to close the pool due to hazardous weather conditions. A message will be left on the answering machine to notify residents of any pool closings. 30. Residents can call 440-238-600 for any pool updates on closings or changes in hours of operation. 31. ALL DECISIONS BY POOL LIFEGUARDS ARE FINAL. Questions or comments regarding the Ledgewood Pool lifeguards, decisions made, or pool rules should be directed to the pool manager or association trustees. Please respect the authority of the lifeguards and follow the rules while you are at the pool. Your cooperation is greatly appreciated. Safety is our number one priority.